Background: We have developed a novel aqueous polyherbal formulation (SIRB-001) consisting of 3 herbs; Rheum palmatum L., Lonicera Japonica and Rehmannia glutinosa Libosch in the ratio 1:1:3. SIRB-001 has demonstrated efficacious effects in psoriasis patients. Objective: This study was aimed at scientifically evaluating the in vitro antipsoriatic activity of SIRB-001. Method: The in vitro anti-psoriatic properties of SIRB-001 were assessed in human keratinocyte cell line; HaCaT. Anti-proliferative effect was studied using MTT assay. Apoptosis was examined by flow cytometry and colorimetric methods. Inflammatory markers and VEGF were determined by ELISA. IL-17/IL-23 secretion was assessed in immune cells. Signaling markers (kinases) by enzymatic assay and Topoisomerase-II activity by Kinetoplast DNA Cleavage assay was tested. Results: SIRB-001 significantly inhibited (p<0.01) proliferation of HaCaT cells and induced apoptosis. Significant (p<0.01) downregulation of pro-inflammatory markers (TNF- α, IFN-γ, IL-6, NO, sPLA2) and VEGF was observed. IL-17/IL-23 secretion was significantly (p<0.01) alleviated in immune cells (RAW264.7 and THP-1). Inhibition of signaling markers (AKT1, FLT3, MAPK1, PRKCA, MAP2K) was observed. SIRB-001 demonstrated inhibition of Topoisomerase-II activity. High Performance Liquid Chromatography (HPLC) analysis of SIRB-001 was carried out using standard marker compounds chlorogenic acid (tR=13.98min), Acteoside (tR=24.22 min) and Rhein (tR=53.76 min). Conclusion: The in vitro results substantiate the anti-psoriatic effect of SIRB-001 in patients. SIRB-001 exerted anti-psoriatic effects at cellular level via multiple arms (antiproliferative, pro-apoptotic, anti-inflammatory, anti-angiogenic). 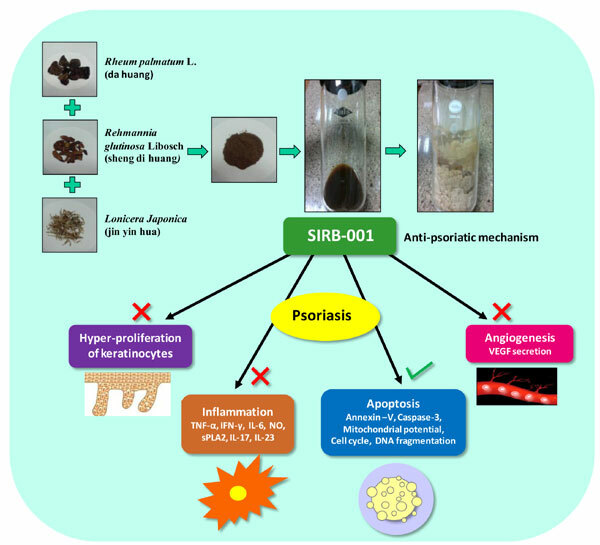 This study provides insight into mechanism of action of SIRB-001 and highlights its promising potential for development as a herbal therapeutic agent for psoriasis, emphasizing the need of further pharmacological evaluation and toxicological studies. Keywords: Apoptosis, herbal, inflammation, keratinocyte, proliferation, psoriasis. Keywords:Apoptosis, herbal, inflammation, keratinocyte, proliferation, psoriasis. Abstract:Background: We have developed a novel aqueous polyherbal formulation (SIRB-001) consisting of 3 herbs; Rheum palmatum L., Lonicera Japonica and Rehmannia glutinosa Libosch in the ratio 1:1:3. SIRB-001 has demonstrated efficacious effects in psoriasis patients.